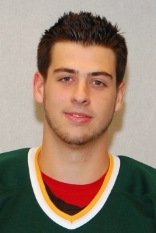 Oswego State sophomore men’s ice hockey forward Luke Moodie has been named the SUNY Athletic Conference Men’s Ice Hockey Player of the Week for the week ending November 7, 2010 for his role in victories over Potsdam, 7-1, and Plattsburgh, 5-3. He registered a natural hat trick over a six-minute span in the second and third period to break open a one-goal game versus Potsdam. In Saturday’s contest against the Cardinals, he netted the game’s first goal and assisted the first Laker score in the third period. Entering the weekend, Moodie had three assists for the season. The Lakers are now 6-0-0 overall and 4-0-0 in the league, and ranked second in the most recent USCHO.com Division III poll.